Halloween – Should You Participate? The October 31st holiday that we today know as Halloween has strong roots in paganism and is closely connected with worship of the Enemy of this world, Satan. It is a holiday that generally glorifies the dark things of this world, rather than the light of Jesus Christ, The Truth. Have you noticed how costumes and masks are getting generally more bloody, gory, and depraved each year? Unfortunately, the gruesome and grotesque and the occult are increasingly glorified in American society, not only on Halloween, but throughout the year in frequent horror movies and television programs. My family does not celebrate it or participate in it. We do not believe that our children are “missing out,” and neither do they. Other days are used for costumes and parties. Happily, all of our children have accepted Jesus Christ as their personal Savior. We have found that Halloween provides an excellent time to remind our children that, as Christians, we are different, and not of this world (Heb. 11:13-16; 1 Pet. 2:11). What about church “Harvest Festivals” held on October 31? Although we understand the rational and good intentions behind them, we don’t think they are the best approach. Our family tends to agree with the author of an article called “Are ‘Harvest Parties’ for Christians?” (written by a self-avowed former witch and now active Christian). Harvest parties on October 31 tend to assume that “our children need something to take the place of Halloween, since they won’t be participating in the secular and pagan celebrations. It suggests our kids are missing out on something. And indeed they are, if we allow them to spend Halloween in celebration.” There are better things to do on Halloween than partying. Also, we need to teach our children that “the fight isn’t against occultists, non-Christians, Christians who feel differently than we about Halloween, or institutions that promote Halloween, but” “against principalities, against powers, against the rulers of the darkness of this age, against spiritual hosts of wickedness in the heavenly places” (Ephesians 6:12, NKJV). Are October 31 “Harvest Parties” the best alternative for Christians? “What are you doing for Halloween?” Ask a Christian parent this question, and be prepared to hear an answer like, “Nothing! We don’t celebrate Halloween.“ Thunder crashes, and you creep away, embarassed for even asking. “What are you doing ON Halloween?” Ask the same parent this slightly altered question, and their whole manner and response brightens. “Why,” they begin, as birds begin to sing and sunshine breaks through the cumulus clouds. “We’re all going to the Harvest Party at church!” A choir sings. A trumpet sounds. You feel privileged just knowing these saints. Let’s take a look at the typical Harvest Party. Certainly, nothing to get concerned about, right? The problem, however, lies in the billing. 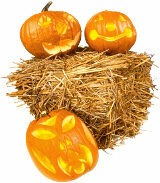 The Harvest Party is usually referred to as the Christian alternative to traditional Halloween hijinx. Alternative, however, implies substitute. It assumes our children need something to take the place of Halloween, since they won’t be participating in the secular and pagan celebrations. It suggests our kids are missing out on something. And indeed they are, if we allow them to spend Halloween in celebration. As a child of four, I contacted the first of many spirit guides (read: demons) while playing with a Kindergarten classmates’ ouija board at a chaperoned Halloween party. This spiritual assault ignited an intrigue with the supernatural that culminated in my lifestyle as a practicing witch: divination, necromancy, channeling, astrology, psychic ability, and spell working. It wasn’t until I was twenty that I met the real Jesus Christ, and was released from the trap that Satan had set for this young prisoner of war sixteen years earlier. There are too many casualities on Halloween and far too few troops fighing the enemy. Instead of partying on Halloween, teach your children how to fight. 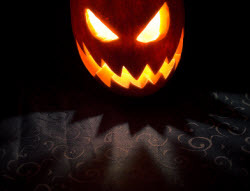 Keep them aware that the fight isn’t against occultists, non-Christians, Christians who feel differently than we about Halloween, or institutions that promote Halloween, but against principalities, against powers, against the rulers or darkness of this world, against spiritual wickedness in high places” (Ephesians 6:12). Instead of celebrating, what’s a Christian to do on Satan’s feast day? PRAY! Intercession and spiritual warfare should be the first item on our agenda. It is NOT a last resort! Join with other families in the church. Have the pastor announce a night of spiritual battle. Organize a group of Christians parents and students from your children’s school or homeschool group. As a family, designate the seven nights before October 31 as Family Prayer Outreach nights. Pray for protection. Pray over both those who engage in prayer warfare and over those who will be out trick-or-treating or at Halloween parties. 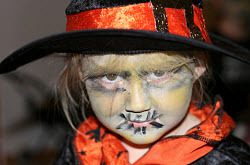 October 31 is a prime recruiting time for witches and Satanists… and a time for interested kids to experiment. Pray that the Lord keeps our kids from falling prey to those who worship the enemy. Pray for discernment. Let the Holy Spirit direct you to specific prayer requests. Pray that the children who are “out there” will somehow “know” to keep away from certain activities. Pray that the Lord hinder the occult rituals. For four years, I lived in a building which over looked a cemetery where occult ceremonial markings were often found. On certain occult feast days, usually between midnight and 3 a.m., I would look down into the darkness and kneel at my window binding the demons that controlled the ceremonies. I’ll never know this side of heaven what effect my prayers had. Maybe a potential sacrifice escaped. Maybe the occultists weren’t successful in summoning their demon. Maybe a new, young recruit decided that this was not the lifestyle he thought he wanted. Pray for the salvation of the occultists. Jesus Christ died for those whom Satan holds captive and deceived, for those who mock Him, who deny His deity or His existence. He doesn’t want them to perish, but to come to Him calling Him Father, Lord. Pray the veil is lifted from their eyes, the Lord allows them to see clearly their spiritual condition and their only hope lies in Jesus Christ. Pray also, about whether the Lord would have you take a more active role in bringing the gospel to Satan’s servants. Let your children know that this is effective warfare. They must know their prayers are heard and acted on by our Father. Let them know they can make a difference. Come October 31, they’ll know they have a job to do. The Facts on Halloween: What Christians Need to Know by John Ankerberg and John Weldon (Eugene, Oregon: Harvest House Publishers, 1996), 48 pp. Mommy, Why Don’t We Celebrate Halloween by Linda Hacon Winwood (Shippensburg, Pennsylvania: Destiny Image Publishers, 1992), 17 pp. Halloween: Trick or Treat , 56 minute documentary exposé.